Hap and Leonard are back, and are about to be plunged into another melee of murder, mayhem and malevolence - clearly signalled when the two detectives are asked for assistance. 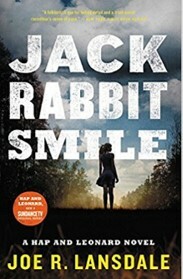 The question posed is what happened to a daughter (she of the eponymous jackrabbit smile) who walked out on her family five years ago? It is clearly signalled because the clients, bible-thumping, fundamentalist white supremacists, have asked for help from devil-may-care unbeliever Hap and the perpetually angry, black, gay, lippy Leonard. Could the clients’ motives be less than pure? How Hap and Leonard have survived in this deeply conservative, gun-toting, down-home, God-loving if god-forsaken sink hole is a puzzle the reader is best advised not to think about (rather like the plot) but take the case they do, with results you would predict: murder, mayhem and malevolence. By Lansdale’s high standards this is workaday stuff (and the pair’s addiction to wisecracking rejoinders to local racists does get tiresome) but it’s easy to digest and fans will happily gulp it down.